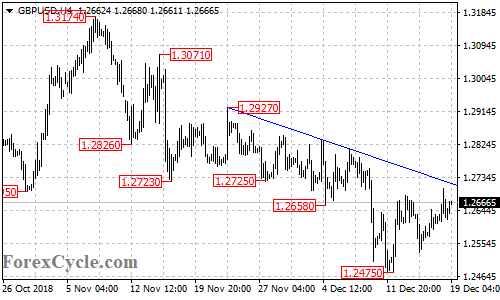 GBPUSD is facing the resistance of the falling trend line on the 4-hour chart. As long as the trend line resistance holds, the bounce from 1.2475 could be treated as consolidation for the downtrend from 1.3174 and another fall could be expected after the consolidation. Near term support is at 1.2600, a breakdown below this level could bring the price back towards 1.2475 previous low. On the upside, a breakout of the trend line resistance would indicate that the downside movement had completed at 1.2475 already, then further rise towards 1.2900 could be seen.